Home > News - June 2016 > Share Market :Weighing Machine Vs Voting Machine..! 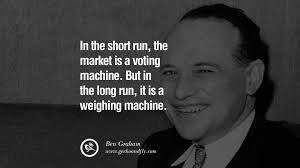 Share Market :Weighing Machine Vs Voting Machine..! In other words, the market is not a weighing machine, on which the value of each issue is recorded by an exact and impersonal mechanism, in accordance with its specific qualities.